Tips & Treasures: Lego Club Magazine - 2 years FREE! 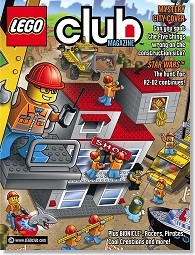 Lego Club Magazine - 2 years FREE! Have a Lego fan in your family? Sign up for the Lego Club (it's free!) and you'll automatically get a free 2-year subscription to Lego Club Magazine. Sign up for Lego Club here. Lego Club members that are under age 7, will automatically receive Lego Club Jr. Magazine instead. Allow 4-6 weeks for delivery of your first magazine. Don't miss upcoming freebies, coupons, or frugal tips! Follow Tips & Treasures through Google Friend Connect, Twitter or Facebook. Or subscribe by reader or email.